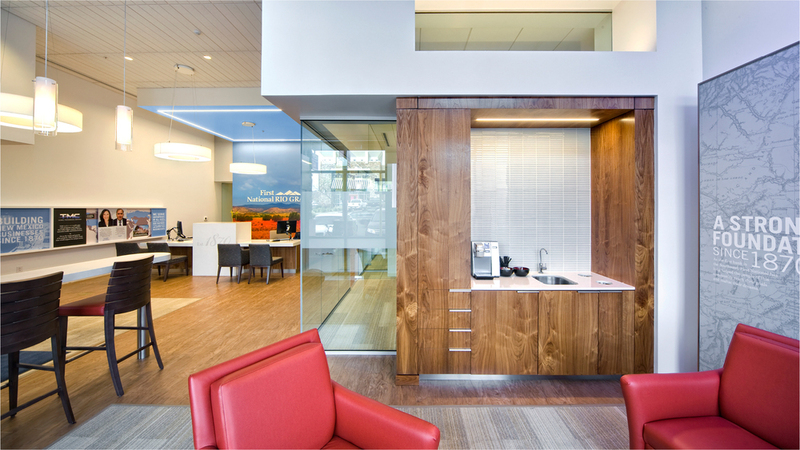 Recently completed, this high-ceilinged, warmly contemporary prototype bank branch establishes branding and architectural guidelines for both new and renovated branches throughout the Southwest. Replacing the traditional row of stand-up bank tellers, two seated teller stations on an axial entry welcome guests and provide everyday banking services, while more extensive transactions utilize the comfortable enclosed and private banking rooms. Guests are always welcome to relax with a cup of coffee in the public library/lounge, or to host a community meeting in the publicly-available conference room. Particular attention was paid to reducing off-brand clutter, while maintaining functionality and enhancing security. We designed custom teller stations to seamlessly conceal myriad banking equipment. Non-critical activities are separated into a back-of-house area, and shared client/employee work areas provide hoteling opportunities while reducing overhead.